High in a remote area of the Oetztaler Alps in northern Italy, 5,300 years ago, Oetzi the Iceman was shot in the back with an arrow. It hit a main artery and he probably bled to death within minutes. His body was preserved in the ice, making him one of the oldest and best-preserved mummies on Earth. 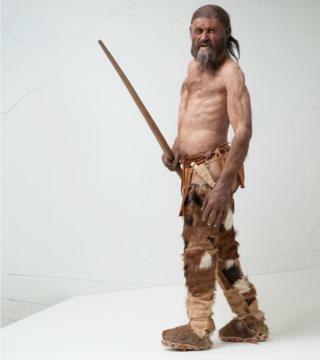 Oetzi was first discovered in 1991 and scientists discovered the flint arrowhead lodged in his shoulder 10 years later. But only in recent months have investigators, led by a senior police detective, focused more intently on how Oetzi was shot. Was it murder? And who might have killed him? Angelika Fleckinger, director of the South Tyrol Museum of Archaeology, where Oetzi's body is on display, called on a professional to investigate. He is Detective Chief Inspector Alexander Horn of the Munich Police Department, who is also head of behavioural analysis with the Bavarian police. He admits to being slightly taken aback at the request. "It was a funny situation, because when I was asked by the director if I work on cold cases, I said 'yes, I do'," Inspector Horn said. But this case was colder than most. "The usual cold case that we have is 20 or maybe 30 years old, and now I was asked to work on a case 5,300 years old," he said. Initially, Inspector Horn did not think he could help. "I thought that probably the body would be in a bad condition. But what I learnt very soon was that it was in perfect condition. It's even in a better condition than some of the bodies I am working on nowadays." As well as visiting the scene of the crime high in the Alps, the inspector was able to draw on the extensive research done on Oetzi over the last 25 years, which includes detailed analysis of his stomach contents and the injuries on his body. Both were to prove key to Inspector Horn's theories. "It looks a lot like a murder," he says. The killer seems to have caught Oetzi by surprise. "Oetzi was shot probably from quite a distance, about 30m (100 ft), which is not a close-contact killing; it's a distance killing." Inspector Horn says Oetzi seems to have been quite relaxed up on the glacier just before he was shot. His own bow wasn't ready for use. "About half an hour before he was killed, he was having a rest up there. He was having quite a heavy lunch or meal at least, so it doesn't seem like he was in a rush or fleeing from something." Another crucial clue came from the injury on Oetzi's right hand - a wound he received one or two days before his death, probably during a fight. "That injury was something we would define as a classic active defence wound. That would be like if somebody... threatens you with an knife and he stabs you, if you grab into the knife and... try to push it away." Oetzi did not suffer other defence injuries, so Inspector Horn believes he won the initial fight - which possibly took place down in the valley. "What we think… is that the killing up on the glacier is probably the continuation of this fight that happened about one-and-a-half days before." Knowing that he was unlikely to win in hand-to-hand combat, Oetzi's killer probably stealthily followed him up the mountain and shot him. The glacier "is a very remote area and probably not a place where you would randomly run into each other", Alexander Horn says. But who was the offender and what were his motives? Inspector Horn says the offender didn't steal Oetzi's valuable copper blade axe and other gear, so it is unlikely to have been a crime for profit. He speculates that it was probably due to "some strong personal emotion". "If there was hate, if it was jealousy, if it was revenge, we will not be able to tell you." Angelika Fleckinger from the Museum of Archaeology says she is very happy so much progress has been made into the big mystery of Oetzi's death. But Inspector Horn says he is still unsatisfied. "I don't think there is a high likelihood we will ever be able to solve that case." The offender "got away with that murder - which I don't like, being in charge of investigations," he said with a wry smile. "I don't like the fact that we have an unsolved homicide there."